"Everything was better than I expected, it was a great success!" 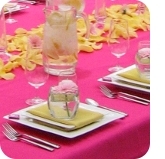 No matter what your needs are, at Crème de la Crème Events, we can make it happen. The list of event types in the menu can be clicked on to obtain more specific details, but they are only the beginning of what we can do.